There’s been some substantial “Big Data” announcements over the past week from Big Blue. Late last week, on the heels of the public disclosure of security breaches at a number of major media organizations, including The New York Times, The Wall Street Journal, and the Washington Post, IBM announced its new “IBM Security Intelligence With Big Data” offering, which combines leading security intellignece with big data analytics capabilities for both external cyber security threats and internal risk detection and protection. You can learn more about that offering here. IBM is also working to make it easier for organizations to quickly adopt and deploy big data and cloud computing solutions. Today, the company announced major advances to its PureSystems family of expert integrated systems. Now, organizations challenged by limited IT skills and resources can quickly comb through massive volumes of data and uncover critical trends that can dramatically impact their business. The new PureSystems models also help to remove the complexity of developing cloud-based services by making it easier to provision, deploy and manage a secure cloud environment. Together, these moves by IBM further extend its leadership in big data and next generation computing environments such as cloud computing, while opening up new opportunities within growth markets and with organizations such as managed service providers (MSPs). Across all industries and geographies, organizations of various sizes are being challenged to find simpler and faster ways to analyze massive amounts of data and better meet client needs. At the same time, an IBM study found that almost three-fourths of leaders surveyed indicated their companies had piloted, adopted or substantially implemented cloud in their organizations — and 90 percent expect to have done so in three years. While the demand is high, many organizations do not have the resources or skills to embrace it. Today’s news includes PureData System for Analytics to capitalize on big data opportunities; a smaller PureApplication System to accelerate cloud deployments for a broader range of organizations; PureApplication System on POWER7+ to ease management of transaction and analytics applications in the cloud; additional options for MSPs across the PureSystems family including flexible financing options and specific MSP Editions to support new services models; and SmartCloud Desktop Infrastructure to ease management of virtual desktop solutions. The new IBM PureData System for Analytics, powered by Netezza technology, features 50 percent greater data capacity per rack3 and is able to crunch data 3x faster4, making this system a top performer, while also addressing the challenges of big data. The IBM PureData System for Analytics is designed to assist organizations with managing more data while maintaining efficiency in the data center – a major concern for clients of all sizes. With IBM PureData System for Analytics, physicians can analyze patient information faster and retailers can better gain insight into customer behavior. The New York Stock Exchange (NYSE) relies on PureData System for Analytics to handle an enormous volume of data in its trading systems and identify and investigate trading anomalies faster and easier. You can learn more about these and other new PureSystems capabilities here. To aid in the detection of stealthy threats that can hide in the increasing mounds of data, IBM recently announced IBM Security Intelligence with Big Data, combining leading security intelligence with big data analytics capabilities for both external cyber security threats and internal risk detection and prevention. IBM Security Intelligence with Big Data provides a comprehensive approach that allows security analysts to extend their analysis well beyond typical security data and to hunt for malicious cyber activity. I’ve been watching this whole Apple “Mapgate” discussion from the sidelines with some bemusement. If you’d have told me a few weeks ago the emerging chatter about the iPhone 5 would come down to a map app’s dysfunction, I would have laughed, but such is the state of our technology polity. On the one hand, the debate may seem filled with frivolity. On the other hand, it speaks to the seriousness with which users take their smartphones and their apps, particularly when it involves one that could be the very thing that comes between they and their next cup of java at Starbucks…assuming they can still find one! Whether or not Apple will relent and offer a Google Maps app in the Apple App Store, says a story by Reuters and citing Google chairman Eric Schmidt, will be a decision made by Apple. Me, I’m still trudging along just fine with my LG “dumb phone,” although I am keeping an open eye towards the looming iPad Mini. I love my original iPad, but I think it needs one of those “Clean My PC” solutions reoriented for original iPads. It’s become more and more lethargic in terms of performance, and sometimes, when I’m in an application the thing will just reset and take me back to the home screen. Not quite the equivalent of a Microsoft Windows “General Protection Fault” or blue screen of death, but coming close. Speaking of finding my way, I wanted to remind folks that the IBM InterConnect event is only a short couple of weeks away in Singapore, October 9-11 at the Royal Sentosa Resort. My airplane tickets have been bought, my hotel booked — now if I could just figure out a way to place myself in a state of somnolence as I board the plane for the longggg journey eastward. If you’d like to learn more about the InterConnect event, IBM is hosting a Twitter Chat this Thursday, September 27, from 9-10 EST. If you’ve never attended a Twitter Chat, now’s your chance. Our own social business guru, Sandy Carter, will be moderating the chat, fielding questions and relating details of the coming InterConnect event. The hashtag for the chat is #IBMInterConnect, so simply log in to your TweetDeck or other Twitter app of choice, enter that hashtag, and be prepared for the discussion this Thursday evening. 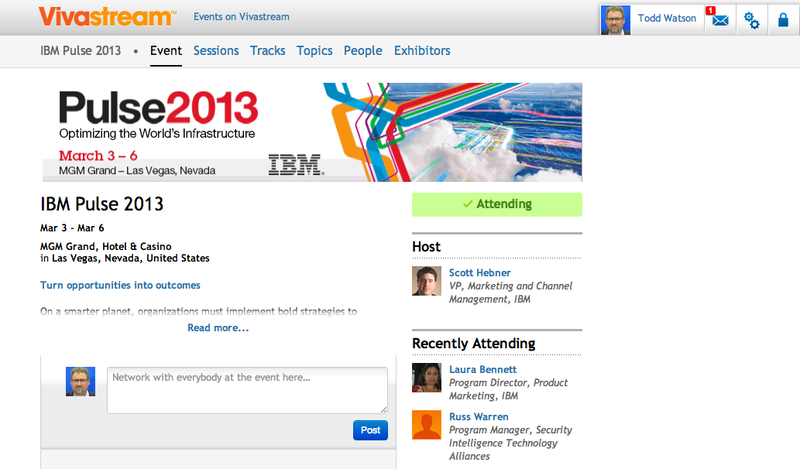 A little background: IBM InterConnect 2012 is a new and unique event to provide you with opportunities to meet and collaborate with business and IT leaders in your region. The IBM InterConnect conference will explore topics and key business imperatives, including unleashing innovations, managing the velocity of change and reinventing relationships and uncovering new markets. Back in April, I blogged here about the new IBM PureSystems line of servers that have been in the works for some years and backed by $2 billion in investment by IBM. Here we are a few short months later, and we’re seeing some substantial uptake of this new line, including in growth markets. Organizations around the world are increasingly looking for ways to reduce IT complexity and overcome the growing worldwide skills shortage. Today, approximately three-quarters of global employers cite a lack of experience, skills or knowledge as the primary reason for the difficulty filling IT positions. Because of this, organizations are searching for new ways of computing that don’t require the additional commitment of significant resources or employee training to set up and maintain. PureSystems meets this demand by providing patterns of expertise –- a new technology model that builds on the experience of thousands of IBM clients and radically streamlines the set-up and management of hardware and software resources. BPTP, a leading Indian real estate company, selected IBM PureSystems to streamline its IT infrastructure to improve the overall home buying experience for its customers. Established in 2003, BPTP has experienced rapid growth over the last decade. Sustaining and building upon this growth required BPTP to find a better computing and storage solution. To meet these challenges, it selected IBM PureSystems for all of its processing and storage requirements. PCCW, a leading information technology outsourcing company based in Hong Kong, has selected IBM PureSystems as the foundation for its new Enterprise Solutions Superstore — an online environment for Independent Software Vendors (ISVs). As a result, they are now able to offer customers applications on the cloud using a Software-as-a-Service model. ValeCard, a multi-industry conglomerate based in Brazil, has achieved 40 percent growth annually over the past three-years. Facing rapid expansion of its business, ValeCard turned to IBM PureSystems to manage thousands of transaction records from contracts with large companies and government entities. Additionally, ValeCard is using IBM PureSystems to help it meet an increasing set of new regulations and standards for data availability. For IBM Business Partners, PureSystems creates a new opportunity to help clients solve the complexity of enterprise IT. From resellers to distributors and Independent Software Vendors (ISVs), more than 700 Business Partners are supporting IBM PureSystems. PureSystems currently run tens of thousands of existing ISV applications across four operating environments including Windows, Linux, AIX, and IBM System i.
Additionally, Business Partners have created more than 160 new solutions and applications that are optimized to run on PureSystems. These patterns of expertise, which span 20 industries, can be accessed through the IBM PureSystems Centre. They include leading solutions from some of the world’s largest ISVs, including ERP systems and applications for the banking, marketing, healthcare and energy industries. Numerous partners are also installing PureSystems in their own datacenters. For example Computer Gross, a managed service provider in Italy, and OneTree Solutions, an ISV from Luxembourg are both using the cloud capabilities of IBM PureSystems as a way to more easily meet the needs of their customers. To help address the new opportunity that PureSystems presents, IBM is also providing training, marketing, certifications and technical validation support to business partners. For instance, dozens of IBM Innovation Centers in cities such as Bangalore, Dublin, Johannesburg and Shanghai are helping Business Partners develop and test their applications using IBM PureSystems. Business Partners can also bring their clients to IBM Innovation Centers to see PureSystems technology at work. In addition, more 1,300 business partners — ISVs, managed service providers, resellers, system integrators and distributors — have been showing their support and interest in PureSystems by attending Business Partner Day and training events in 27 cities around the world. PureSystems cloud capabilities are also drawing interest, with 500 developers using the PureSystems Cloud Trial to create applications through IBM’s SmartCloud that are ready to run on IBM’s new expert integrated systems. To help credit-qualified clients easily acquire IBM PureSystems, IBM Global Financing is making available a range of financing options. As a result, clients will be able to avoid paying cash up-front, while lowering their total cost of ownership. This is the first time that clients can lease the entire value of the system, including hardware and software. Credit-qualified clients that elect financing can see immediate benefits with PureSystems while deferring their first payment for 90 days. Additionally, IBM Global Asset Recovery Services can buy back servers, including those made by HP and Oracle, for clients migrating to IBM PureSystems. There are two models of the PureSystems family available — PureFlex System and PureApplication System. PureFlex System enables organizations to more efficiently create and manage an infrastructure, while PureApplication System allows organizations to quickly deploy and reduce the cost and complexity of managing applications. Both have already shipped to leading clients in 5 continents. You can learn more about IBM PureSystems in the Expert Integrated Systems blog here. 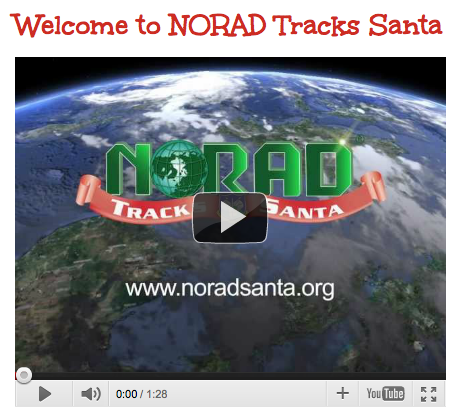 I’ve been too busy to keep an eye out for Norad Santa this year, but for those of you with children out there, you’ll be happy to know you can now track Santa via the NORAD Tracks Santa app, available for both Android and the iPhone. For more than 50 years, NORAD and its predecessor, the Continental Air Defense Command (CONAD) have tracked Santa’s flight. The tradition began in 1955 after a Colorado Springs-based Sears Roebuck & Co. advertisement for children to call Santa misprinted the telephone number. Instead of reaching Santa, the phone number put kids through to the CONAD Commander-in-Chief’s operations "hotline." The Director of Operations at the time, Colonel Harry Shoup, had his staff check the radar for indications of Santa making his way south from the North Pole. Children who called were given updates on his location, and a tradition was born. It’s good to know that Santa’s multi-platform! If, on the other hand, you’re all about tracking leading healthcare providers, look now towards Hong Kong-based Quality HealthCare Medical Services (QMHS), which partnered today with IBM to build a virtualized infrastructure for its practice. The project involves the consolidation of more than 100 servers into a cloud environment that hosts QHMS’ mission critical systems that serve over 600 medical centers in Hong Kong and Macau. The optimized infrastructure will enable QHMS to reduce IT maintenance and disaster recovery costs, ensure production system maintainability and performance, and achieve energy-savings. By reducing the number of physical servers from over 100 to eight IBM System x3650 servers and centralizing storage, QHMS is expected to reduce IT operational costs by 25 percent and software license and related maintenance costs by 23 percent. The new and highly redundant server infrastructure also includes an automated centralized back-up system of IBM System Storage DS3500 Express that enables fast, secure and cost-effective storage management, back up and recovery. Additionally, the deployment of the IBM Cognos Business Intelligence solution provides financial key performance indicator (KPI) and analysis, creating the opportunity to gain more timely business information for better business performance management and smarter decision-making. QHMS aims to monitor business performance in over 600 medical centers. With IBM Cognos BI, QHMS can build a standardized and centralized information delivery platform that enables QHMS to monitor the performance of a wide range of services running on different systems. QHMS’ management team can now access timely business information with just a few mouse clicks, speeding response times to business needs and patient demands. Quality HealthCare Medical Services Limited is a physician led provider group offering an integrated range of healthcare services including facilities management, third party plan administration and paramedical support. The Group provides care for private and corporate contract patients through a network of more than 580 Western and Chinese medical centers, and 47 dental and physiotherapy centers. In 2010, its network recorded more than 2.8 million healthcare visits. It also operates Hong Kong’s longest-established nursing agency and one of its medical practices has been serving Hong Kong people for over 140 years. There is no investment you can make which will pay you so well as the effort to scatter sunshine and good cheer through your establishment. — Orison Swett MardenAccording to the U.S. Department of Energy, data centers can consume up to 100 times more energy than a standard office building.In fact, less than 15% of original source energy is used for the information technology equipment within a data center. 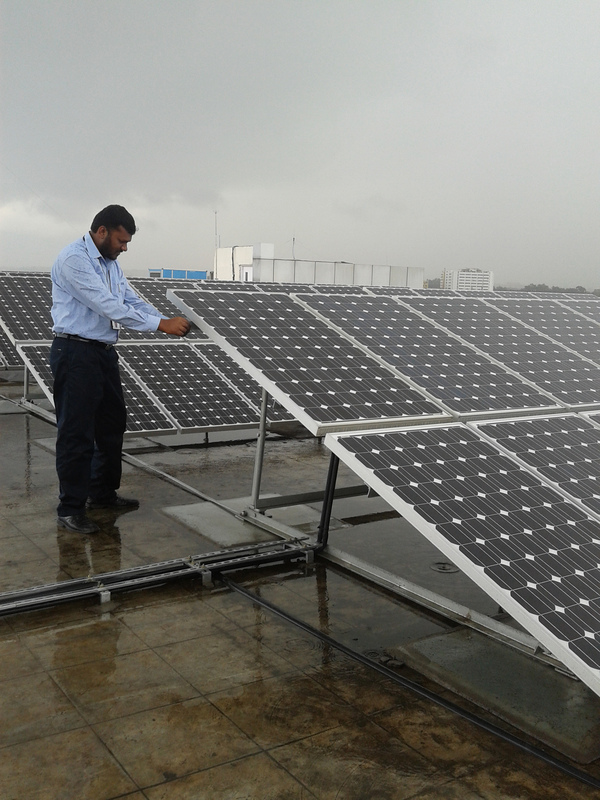 A technician inspects IBM's solar-power array atop the roof of the company's software development lab in Bangalore, India. The technology is designed specifically to run high-voltage data centers, integrating AC- and DC-based servers, water-cooling systems and related electronics. The 6,000-square-foot array is capable of providing a 50-kilowatt supply of electricity for up to 330 days a year, for an average of five hours a day. IBM said today that is rolling out the first solar-power array designed specifically to run high-voltage data centers, integrating AC- and DC-based servers, water-cooled computing systems and related electronics. The new array is spread over more than 6,000 square-feet of rooftop covering IBM’s India Software Lab in Bangalore. The solar array is capable of providing a 50-kilowatt supply of electricity for up to 330 days a year, for an average of five hours a day. By employing unique high-voltage DC power conditioning methods – and reducing AC-DC conversion losses – the new IBM solution can cut energy consumption of data centers by about 10 percent and tailors solar technology for wider use in industrial IT and electronics installations. In many emerging markets, electrical grids are undependable or non-existent. Companies are forced to rely on expensive diesel generators. That makes it difficult and expensive to deploy a lot of computers, especially in the concentrated way they’re used in data centers. Using IBM’s solution, a bank, a telecommunications company or a government agency could contemplate setting up a data center that doesn’t need the grid. The solution, in effect, creates its own DC mini-grid inside the data center. High-voltage, DC computer servers and water-cooling systems are beginning to replace traditional, AC-powered servers and air-conditioning units in data centers. IBM’s Bangalore array is the first move to blend solar-power, water-cooling and power-conditioning into a “snap-together” package suitable to run massive configurations of electronic equipment. IBM plans for the Bangalore solar-power system to connect directly into the data center’s water-cooling and high-voltage DC systems. The integrated solution can provide a compute power of 25 to 30 teraflops using an IBM Power Systems server on a 50kW solar power supply.